MLS’s eternal expansion plan: Crazy like a fox, or just crazy? And since this became an issue in Deadspin’s comments section: Yes, I know about Soccer United Marketing, the MLS-owned marketing company that handles such North American events as the Gold Cup; no, just because MLS according to one report paid $450 million to buy back a 25% share of SUM to regain full ownership doesn’t necessarily mean the league is “worth” an extra $1.8 billion, any more than the fact that people are paying $150 million for expansion franchises means those are worth that much; and no, nobody really knows how much SUM is worth since it won’t release any revenue figures. It’s almost certainly worth something, but as University of Michigan economist and Soccernomics co-author Stefan Szymanski estimates, probably not enough to make a huge difference in the league’s profitability once it stops cashing $150 million expansion checks. I’m going to keep digging into this in the future, but for now that’s the best verdict available. And if you’d like to hear me talk even more about MLS and its future, I was interviewed on 700 WLW in Cincinnati yesterday, which you can hear here starting at the 67:29 mark. And coming up tonight, I’ll be on 590 KFNS in St. Louis at 6:20 pm Central time, and then KXTG-102.9/750 The Game in Portland, Oregon at 5 pm Pacific time, which is right afterwards because I am apparently a time traveler. Or the earth is round, definitely one of those two. For the past two years, I’ve been honored to be a weekly guest on Heather McCoy’s radio show on KUCI in Irvine. Tomorrow morning is her last show, and expect a star-studded cavalcade of, okay, I think it’s probably just going to be a regular show. But who knows? 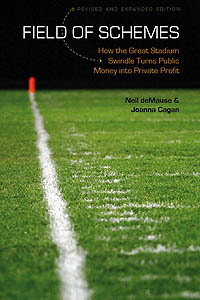 Maybe we’ll solve the problem of public sports subsidies once and for all. You never know — so tune in tomorrow morning at 8 am Pacific (11 am Eastern) and find out! And if you miss it, the archive of tomorrow’s show (and all past shows) will remain available via the Heather McCoy Show podcast page. It’s no substitute for hearing us talk about the latest stadium news, but given that we were probably going to be talking about the possibility of any NFL teams moving to L.A. for the next few months, reruns might not end up being all that different. WABE radio in Atlanta kicked off a week-long series yesterday on the metro area’s multiple new stadium and arena deals for the Falcons, Braves, and possibly Hawks, and I had the honor of being one of the first guests, pointing out that while there are certainly cities that got worse deals (hello, Indianapolis! ), that’s not really something to brag about. You can listen to the whole interview here. More interesting to me (since I know what I was going to say already) is Thursday’s upcoming appearance by Cobb County Commission chair Tim Lee, who will try to explain why it made sense to throw $300 million at the Braves to get them to move to a new stadium in the suburbs, plus maybe what’s up with that pedestrian bridge that won’t be ready in time to get fans from their cars to games, plus maybe the soaring ticket prices planned for the new place, plus even maybe why he secretly hired a lawyer with county funds to negotiate the Braves deal without even telling his fellow commission members, then lied about having done so. Come to think of it, I would have rather skipped my appearance yesterday and instead gotten to interview Lee. Now that would be some must-see radio. I haven’t written much about the sports ticket bubble lately (though there’s plenty to comment on, including the Pittsburgh Pirates‘ no-fee week and some impressively low StubHub prices for the New York Liberty). If you’ve been wanting an overview of the lay of the deflating-ticket-price land and what it could mean for the sports industry, check out my new article on the same in Slate. On a related note, I’ll be on ESPN 1080 in Orlando at 10:05 am tomorrow (Friday), talking about my Nation article and the Slate article. If you’re in Orlando, tune in on your radio; if not, use the streaming doohickey. Just a note that I’ll be on 830 WCCO in Minneapolis for 10-15 minutes this morning starting at 9:35 Central time, talking about the Minnesota Vikings stadium situation. Tune in online, or via one of those radio things if you’re actually in the Twin Cities. Quick programming note: I’ll be appearing on Minnesota Public Radio today in the 9 to 10 am hour (Central time &mdash that’s 10 to 11 Eastern), discussing the Minnesota Vikings stadium situation. Ted Mondale, the state official appointed to lead the push to build a new stadium, will be another guest, so expect fireworks, or at least some heated debate. Those of you who actually live in Minnesota and listen to old-fashioned radios, I assume you know what channel to turn to. For everyone else, you can listen online here. I’m going to be on 1010 AM CBS Sports Radio in Tampa Bay this afternoon from 4:05 to 4:20 pm, discussing the Rays stadium mess. If you’re not in the Tampa area, you can still listen live online; I’ve been promised that the show will be a “debate” on the Rays’ situation, so I’ll be bringing my back hump. UPDATE: This has been rescheduled for tomorrow, Tuesday, May 4, same time and station. A quick programming note: I’m scheduled to appear on Rob Breakenridge’s show on CHQR radio in Calgary tonight, starting at 8:05 pm Mountain (10:05 Eastern); listeners elsewhere should be able to tune in via the web stream. Not sure what we’ll be talking about, but this is a pretty good bet, as is the ongoing Phoenix Coyotes imbroglio. No joke this time: Barring A-Rod getting caught eating baby seals or something, I’ll be on ESPN Radio tonight at 8:25 pm Eastern to talk about stadiums and the economy. Then on Friday, at the ungodly hour of 6:30 am Eastern, I’ll be on WBAI-FM in New York to specifically talk about the new Yankees and Mets stadiums. Both shows will be streamed live online, and I’ll post any archives here as well. I’m scheduled to be on ESPN Radio’s Brian Kenny Show on Monday, starting at 8:27 pm Eastern time and running till 8:34 or something. The topic: “sports and the economy,” which is sure to touch on the Citi Field deal. You can listen on your local ESPN Radio affiliate, or just click on the web stream here. UPDATE: My interview was postponed because of the A-Rod thing. I’ll post here if and when it’s rescheduled.